A charming filly – sweet as they come, feminine, leggy and strong. 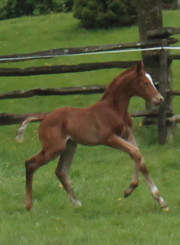 Wild Heart is independant and friendly – ready to engage with people or the other foals. 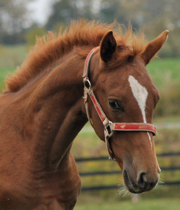 You can see similarities in frame and face with her younger half sister Wavin’ Flag – their common sire coming through. Wild Heart is shown from days old to 11 months old. Wild Heart was awarded a “Premium” at her German Oldenburg Verband inspection, and praised for her lovely head and neck, feminine type, and good movement. 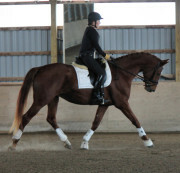 UPDATE: Wild Heart has been sold to a Canadian dressage trainer. It was “love at first sight” when Wild Heart turned on her engines. I am extremely happy that this filly will be with someone who can chanel her powerful movement, and develop her into a top dressage partner. UPDATE: The last picture shows Wild Heart, undersaddle, at 3 years old.